The Sloane Ranger enjoyed his best year sans Danger. Does he go even better in 2017? Sloane took over the mantle as the number one midfielder at Adelaide last season after Danger departed. He had a couple of ordinary games to start the year with a 79 and a 67. However, he bounced back after that to score over 100 in 12 games and went on a great run from rounds 11 through 17. Whilst Adelaide didn’t seem to miss a beat when Danger left, it took Rory a couple of games to get things on track and he scored his first 100 in round 4. Certainly his back half was far better than the front in 2016, this won’t be the same in 2017 as the Crows only play 4 teams that made finals last year before having their bye, they are GWS in round 1, Hawthorn in round 2, North in round 7 and Geelong in round 11. This leaves a heap of games where he is likely to get off the chain and go big. He is priced fairly highly, but he probably won’t drop significantly in a hurry. His average did dip in 2015, but that was predominantly due to a couple of facial injuries that he sustained, he only played 16 games that season, but has played 21 or 22 every other season since 2012. The only reason he missed one game (the last one) last year was due to a suspension. Also the fact that he missed games in 2015 due to an impact injury and not a soft tissue or joint issue makes me a lot more confident in selecting him. Last season did see him return to his form of 2014, but interestingly last year saw him have 580 disposals, his best yet and 59 higher than ’14, 162 tackles which was his best and 15 more than ’14. The let down was his K:H ratio was less than 1 which meant more handballs than kicks, but this isn’t anything really new for him, apart from 2012, every other year has been either less kicks or not many more than handballs. He did get 34 hitouts last year, his best by far, but with the demise of the third man up rule he won’t be scoring them this year, but 34 points won’t break the bank! I am sure that us fantasy coaches aren’t the only ones that noticed that he had his best statistical season of his career last year. It will no doubt bring more heat to him on the field. As I mentioned earlier, he is now the top dog in the midfield for the Crows. He averaged just under 106 as the top dog, can he push even higher than this? And the emergence of Matt Crouch last year should only continue further in 2017. This could mean slightly less ball for Sloane in the Adelaide midfield. On top of that we have Brad Crouch in there also. The only saving grace will be the changing role of Scott Thompson. But who will take those points he will be leaving on the table. The Crouch boys or Sloane? He is priced not too far from his peak score, he also hasn’t averaged over 110 in his career. He comes in more expensive than others that you might consider more value and could average something similar like Priddis, Lewis, Joel Selwood and Gary Ablett. So whilst not the most expensive player you may be able to select other cheaper ones to provide a bit more value to your side. King – Sloane is a king, he is a good, proven scorer who should average his 106 this year at a minimum. I believe he can lift his output by a couple of points. He averaged the 12th highest last year for a midfielder. He should be able to hold that position and would be a solid selection for your side. To be honest it is very difficult to find reasons not to select him. He should also be going very high in draft leagues. 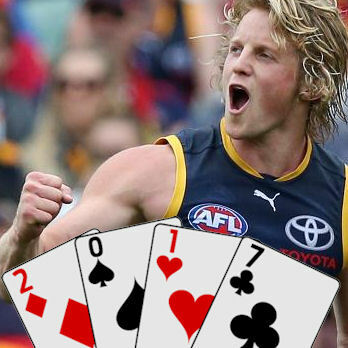 What does Rory Sloane average this year? FOLLOW ME ON TWITTER: @pkd73 for all thing AFL Fantasy (and more). Got something to say about the deck? Use the hashtag… #DeckofDT. Nice write up, love your work Dunny. You get what you pay for with Sloaney. Likely to average around what he’s priced at. He’s probably a no for me at this stage in classic (better value around?) but I’ll be keeping a very keen eye out for him in draft formats. I was thinking of picking Sloane until I found so many gems that were much cheaper. Tackling machine. 105+ average easily. Will flourish this year yet again. He’s a magnet, attracted a 10 out of 10 missus and attracts the ball too. Solid POD for what he can produce. Will be the number 1 tag every week which has to have an effect at some stage.